Thanet Coast and Sandwich Bay SPA is located on the north Kent coast, and covers an area of 18.7 km2. The site consists of a long stretch of rocky chalk shore, adjoining areas of estuary. Overwinter, the area regularly supports up to 940 individual turnstones (5 year peak mean 1991/2 – 1995/6) which represents at least 1.3% of the Western Palearctic wintering population (JNCC, 2015). Some commercial fishing, including potting and netting, occurs within the site. Harvesting of bait and shellfish occurs from the shore and has caused a small amount of physical damage to the chalk reef. Bait digging activities are also undertaken on a small scale at Sandwich Bay. Numbers of commercial vessels fishing within the SPA boundaries are very small. KEIFCA is responsible for assessing the effects of commercial fishing within this site and must implement appropriate conservation measures to avoid damage to EMS by fisheries activities. 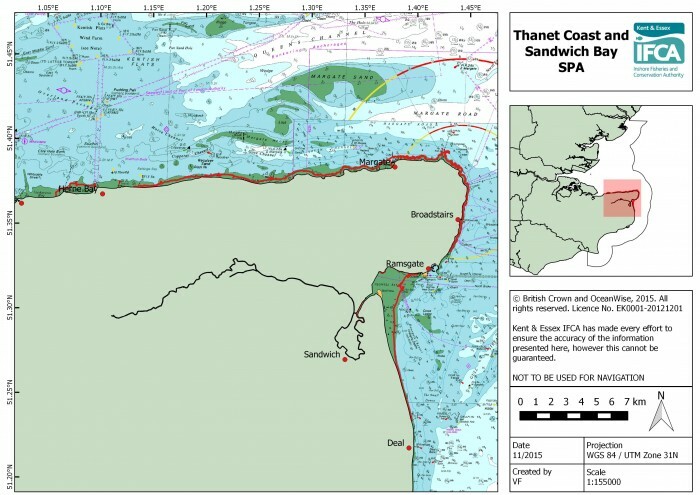 In Thanet and Sandwich Bay SPA the intertidal and subtidal chalk reefs have been identified as at risk of damage from bottom towed fishing gear, and in response KEIFCA have implemented a Byelaw prohibiting the use of this gear over the chalk reef features. In addition to assessing the site and creating management plans, KEIFCA is also responsible for the enforcement of fisheries byelaws and regulations within this site.